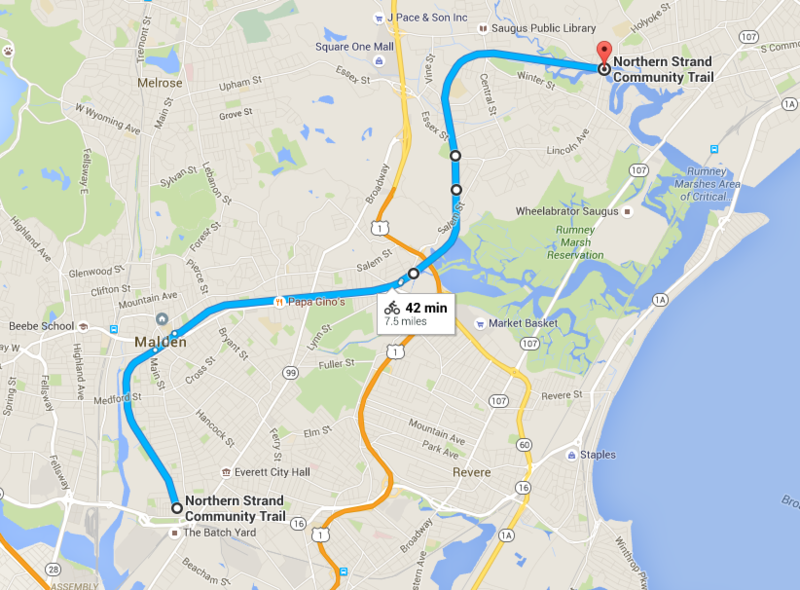 Map – Bike to the Sea, Inc. The Northern Strand Community Trail (screenshot above or interactive Google map) eventually will go through Lynn to Nahant Beach. This map shows where the trail is completed (as of June 30, 2016), from Everett, through Malden, Revere, and Saugus to the Lynn line. You can also download this brochure with map (pdf file). You can now ride or walk the trail in Everett, Malden, Revere, and Saugus. All that remains in Bike to the Sea’s goal of creating a trail to the beaches in Revere, Lynn and Nahant is extending the trail from Saugus through Lynn. The city of Lynn has not yet approved those plans. In Everett, you can access the trail near Air Force Road and the SkyZone Indoor Trampoline Park, not too far from the Best Buy store. It then runs past the Madeline English School before entering Malden behind the Bell Rock cemetery. In Malden, there are two main access points for the trail near Malden Square. 1.) On the westbound side of Rte. 60, across the street from Malden High near the hockey rink parking lot. That will take you north as far a Beach Street in Malden (not too far from the Revere movie theater). 2.) On the eastbound side of Route 60 behind the Dockside Restaurant. This will take you south through Everett. It then ends near the Skyzone Indoor Trampoline Park, not too far from the Best Buy, in Everett. In Revere, you can access the trail where Lynn Street meets Wesley Street in Malden, near the Revere line. In Saugus, you can access the trail where Salem Street meets Franklin Street in Revere, near the Saugus line.